TUMON, GUAM (28 October 2018) The Western Pacific Regional Fishery Management Council yesterday in Guam concluded its four-day meeting in the Mariana Archipelago with the following recommendations, among others, regarding Guam and Hawaii nearshore fisheries and other matters. Under the Magnuson-Stevens Fishery Conservation and Management Act of 1976, the Council has authority over fisheries seaward of state waters of Hawaii, American Samoa, Guam, the Commonwealth of the Northern Mariana Islands (CNMI) and the US Pacific Remote Islands. Bottomfish annual catch limit (ACL): The Council recommended that the National Marine Fisheries Service (NMFS) set an ACL of 66,000 pounds for fishing year 2019. Currently, Guam harvests 29 percent of that recommended bottomfish ACL. The next benchmark assessment, scheduled for review in February 2019, will provide new information to set the ACLs for fishing year 2020 to 2022. Mandatory fishery license and reporting: The Council requested that the Guam Division of Aquatic and Wildlife Resources coordinate with the Guam Attorney General and the Guam Legislature to initiate the Guam Administrative Rules and Regulation process establishing the fishery mandatory license and reporting. Guam Ocean Fishery Management Council: The Council encouraged the Government of Guam to expedite the appointment of the members of the Guam Ocean Fishery Management Council and reduce the paperwork requirements for the community and the public to serve in it. Marine preserve areas: The Council directed staff to communicate with the federal Marine Protected Area Advisory Committee regarding the findings of the “Fishing Community Perceptions on Marine Preserve Siting Process” report, including procedural justice, transferred effects, safety, etc., and to provide the final report to the local federal agencies for use in their management objectives. Precious corals essential fish habitat (EFH): The Council directed staff to prepare an amendment to the Hawaii Fishery Ecosystem Plan (FEP) to revise the precious corals essential fish habitat (EFH) and prepare the document for final action at the Council’s March 2019 meeting. The Council selected the following preliminarily preferred options for the staff to further analyze: a) revise existing beds and designate new beds as EFH for deep-water precious corals, b) update geographic extent and habitat characteristics for shallow-water precious corals, and c) update the FEP. ACLs for main Hawaiian island (MHI) non-Deep 7 bottomfish, deep-water shrimp, Kona crab and preciouscorals: The Council recommended NMFS set the MHI non-Deep 7 bottomfish ACL at 127,205 pounds and MHI deep-water shrimp ACL at 250,773 pounds for fishing years 2019-2021 and the MHI Kona crab ACL at 3,500 pounds for fishing year 2019. For precious corals, the recommended ACLs for 2019-2021 are Auau Channel black coral 5,512 pounds; Makapuu Bed pink coral 2,205 pounds; Makapuu Bed bamboo coral 551 pounds; 180 Fathom Bank pink coral 489 pounds; 180 Fathom Bank bamboo coral 123 pounds; Brooks Bank pink coral 979 pounds; Brooks Bank bamboo coral 245 pounds; Kaena Point Bed pink coral 148 pounds; Kaena Point Bed bamboo coral 37 pounds; Keahole Bed pink coral 148 pounds; Keahole Bed bamboo coral 37 pounds; and precious coral in MHI exploratory area 2,205 pounds. Hawaii bottomfish fishery: The Council directed staff to evaluate options for improving conservation and management of the Hawaii bottomfish fishery, including an assessment of data collection, consistency of federal and state regulatory measures and harvest controls, and monitoring and enforcement mechanisms. Marianas Trench Marine National Monument: The Council directed staff to communicate to the Administration that the fishing prohibitions be removed for the Marianas Trench Marine National Monument and allow only Guam and CNMI-registered vessels to fish there. Okeanos Marianas: The Council directed staff to write to the Okeanos-Foundations for the Sea in New Jersey and cc the governors of Guam and the CNMI noting that the Council commends the development of the Okeanos Marianas vessel as a traditional method for addressing climate change impacts and encourages the Foundation to keep the vessel in the CNMI and transfer its ownership to the local Okeanos Marianas organization in Saipan. Malaloa longline dock extension: The Council directed staff to write to American Samoa Gov. Lolo Moliga noting that $250,000 is available in the Sustainable Fisheries Fund for the project and inquiring if the American Samoa government has secured funding and necessary permits for the construction of the dock. American Samoa fisheries data collection: The Council requested the American Samoa Department of Marine and Wildlife Resources (DMWR) update the fishery regulation to include mandatory licensing for the fish dealers and mandatory reporting for the commercial fishermen. The Council also requested DMWR to finalize the review of the draft Memorandum of Agreement for Data Sharing that was provided to DMWR. Data collection: Requested the territory and state fishery management agencies to explore electronic reporting to improve the collection of fishery data for their bottomfish fisheries. Territorial fishing agreements: Directs staff to explore a funding sequence of US Participating Territory specified fishing agreements that will utilize a rotational sequence in future allocations. Habitat: Council directed staff to convene a regional workshop of experts to discuss habitat related issues, including non-fish impacts on EFH and habitat areas of particular concern, prior to the convening of the national workshop on habitat to be convened by the Council Coordination Committee. Aquaculture: The Council directed staff to look at the current regulatory regime in place in federal waters to determine the needs for developing offshore aquaculture, determining the best sites for aquaculture and obtaining funding to assist local interests to develop aquaculture in the Western Pacific Region. Research priorities: The Council directed staff to work with the Plan Team to include in its research priorities the impacts of climate and ecosystem changes to pelagic fisheries and coral reef ecosystems. North Pacific and South Pacific Regional Fishery Management Organizations: The Council directed staff to include funding to support Council participation in these two new international commissions. Recusal from Voting: The Council directed staff to prepare a letter to NMFS requesting that the financial interest attribution policy requiring a Council member to recuse him/herself from voting not be applied to an employee of a company. Council Officers: The following Council members were appointed as its officers for 2019: Archie Soliai, chair; Christina Lutu, Vice Chair, American Samoa; Dean Sensui, Vice Chair, Hawaii; Michael Duenas, Vice Chair, Guam; and John Gourley, Vice Chair, CNMI. Advisory Panel:The Council appointed its new Advisory Panel members as follows. For American Samoa: Krista Corry, Sam Meleisea, Carlos Sanchez, Dustin Snow, Will Sword and Brian Thompson and, as alternate members, Joseph Faaita, Edgar Feliciano and Nonu Tuisamoa. For CNMI: Richard Farrell, Mike Fleming, Perry Mesngon, Cecilio Raiukiulipiy, Raymond Teregeyo and Jun Yamagishi and, as alternates, Juan Diego Blanco, Floyd Masga and Ray Tebuteb. For Guam: Judith Amesbury, James Borja, Ken Borja, Jason Miller, Matthew Orot and Felix Reyes and, as alternates, Jason Biggs, Tatiana Talavera and Albert Yanger. For Hawaii: Nathan Abe, Khang Dang, Ed Ebisui III, Carrie Johnston, Gil Kualii and Clay Tam and, as alternates, Michael Lee, Shyla Moon and Matt Yamamoto. 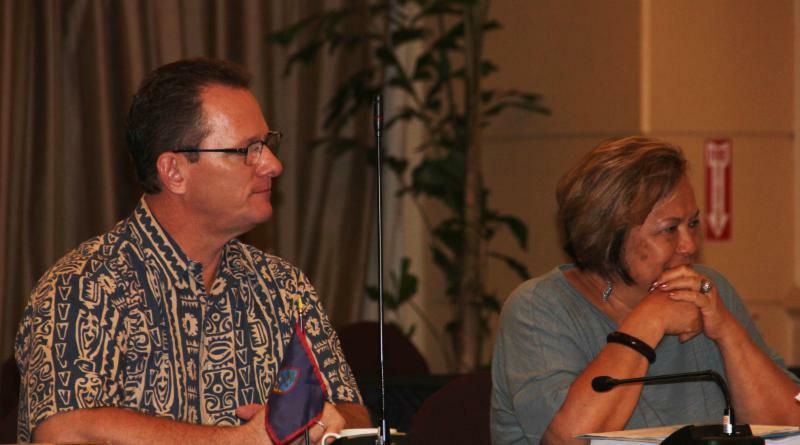 For the full agenda and background materials on the meeting, go to www.wpcouncil.org/category/upcoming-council-and-advisory-body-meetings or contact the Council at info.wpcouncil@noaa.gov or (808) 522-8220.